Every now and then we have a seminar that I miss because I consider it to lie outside my area of expertise. While this might help save time, I later regret not attending those “out of my comfort zone” kinds of talks because I know for a fact that one tends to learn the most out of people who work in unrelated areas. The reason is simple: those folks do not have any of my default assumptions and tend to ask great questions. I can speak from a personal experience as it is all too often that, when I visit other places and meet people who work in areas that are closely related to my lab’s interests, I refrain from asking about certain things because “well, they probably thought of THAT”. This is a mistake, and the only way to rectify it is to attend lectures that are not directly related to what one does. Needless to say, you also learn a lot just by listening to such talks. Today was no exception. I really enjoyed hearing Barney Grubbs of Stony Brooke University (http://www.chem.sunysb.edu/faculty/grubbs.shtml) speak about his lab’s work in the area of materials chemistry. One of the reactions caught my eye. You can read about it in the link below. In order to make the tellurium-containing molecule shown, Barney used an interesting coupling partner – a tertiary alcohol – in place of our “usual suspects” such as organotin or organoboron reagents. I don’t think I saw a transmetallation accomplished in this fashion too many times before! You can think of a mechanism… I think it is quite interesting. Have you noticed how political correctness has made its imprint on the scientific discourse that is being shaped up at conferences? The days of hearing offensive remarks for the sake of scientific truth are more or less behind us, yet there is something to be said in defense of raw and unfiltered emotion that used to be omnipresent at scientific meetings. Maybe the feel-good atmosphere we experience these days is because the stakes are higher and people are thinking a lot more about their image and reputation? We used to say that arguments and politics in science get nasty because the stakes are low. This is true of the older days, but maybe not anymore? The way things used to unfold is almost inconceivable to those who embark on a career in science nowadays. And I am not even talking about one’s behavior at a conference. When I was a postdoc we used to have a special term when a confrontation between two people was taking place. That “blissful” moment, when one of the parties to an argument was being attacked, was compared to him/her being asked to bring out the “shinebox”. The video below explains this analogy. Here you see the immortal “Billy Batts” scene from Scorsese’s “Goodfellas” (I apologize for the coarse language, but this is Scorsese, not me). What you see is an analogy to how heated arguments used to develop. I love DeNiro’s role in this scene when he says “Insulted him a little bit…” at 3:08-3:13. DeNiro corresponds to a peacemaker (albeit a temporary one!). Notably, there is often someone like that in a scientific argument as well. This sort of stuff is not happening in science anymore, though, because we are more civilized. Are we not? I have not posted anything for a few days because of my travel to Beijing and, afterwards, to Xuzhou (Jiangsu province). Currently, I am attending the ISOSDD-4 meeting (International Symposium on Organic Synthesis and Drug Discovery). I was invited to attend this conference by an old friend of mine, Professor Guigen Li of Texas Tech, who also has a research outpost in Nanjing (Jiangsu Province). Guigen and I go way back, to our days in the Sharpless lab at Scripps where we were both doing our postdoctoral stints in the late 90’s. 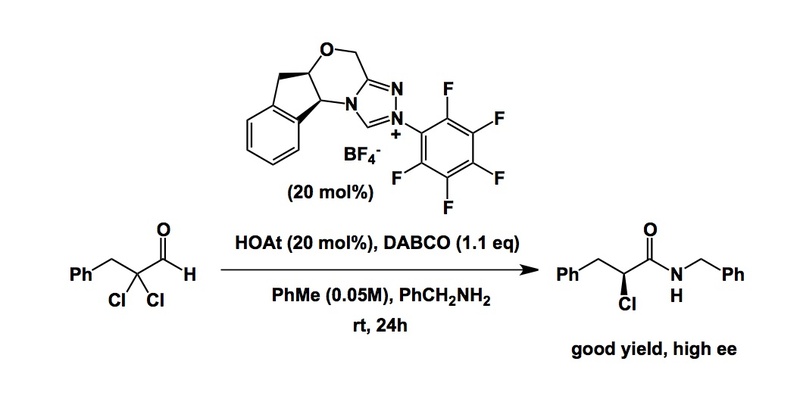 Here, by the way, is a link to an important paper by Guigen, Chang, and Sharpless, which constitutes the first disclosure of the asymmetric aminohydroxylation reaction. This was, in fact, Guigen’s discovery, and is one of the many items that come to mind when I look back at those eventful years. Hans Adolfsson of Stockholm University is another person whom I have not seen for many years. He also hails from our days in the Sharpless lab. Hans is attending this meeting as well and I have been very happy to interact with him too. Hans is now full of extra responsibilities as the Vice Chancellor at Stockholm University. Despite his busy schedule, Hans has a vibrant research lab that has done some excellent work in the area of asymmetric hydrogenation using peptide ligands. One of the curious recent findings in the Adolfsson lab is that of amide reduction into enamines. While there is no clear-cut mechanistic rationale for this process, it is one of the most remarkable paths to enamines I know. 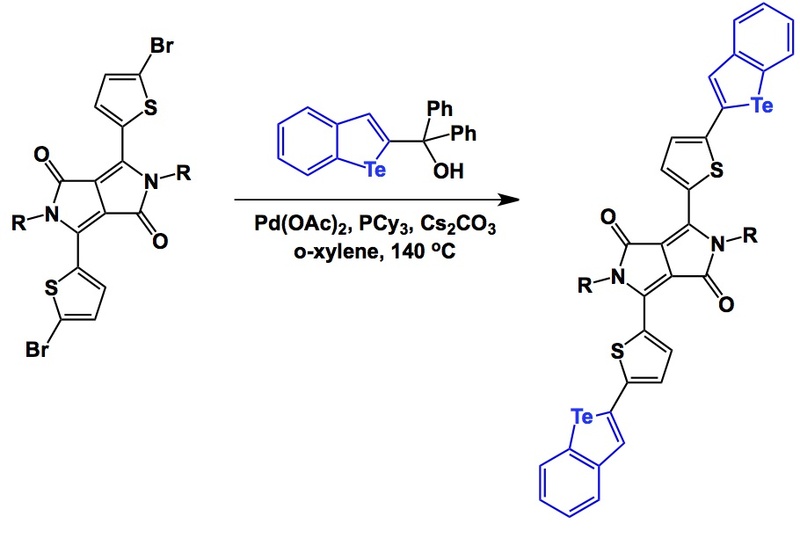 If you follow my posts, you know that I always emphasize novel approaches to well-established intermediates in organic chemistry. This, in my mind, always offers fertile grounds to discovery. If I told you that there are some real eyesores in synthesis, I am sure you will know exactly what I mean. We have all been there. For example, you run a cyclization reaction and note that the best yields you record are for the so-called gem-dimethyl containing substrates. 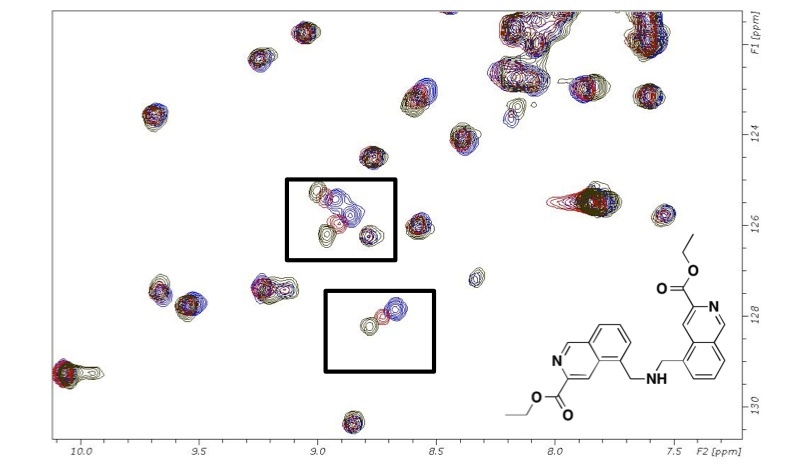 The reason is that you need some help from the Thorpe-Ingold effect that contributes to improved kinetics of cyclization by reducing the number of accessible conformers (plus some other reasons). Or you need a pro-nucleophile with a pKa that is suitable for the weak base you intend to use. Then you use a gem-diester. Again, you are stuck with it at the end, although this case is not as bad as the gem-dimethyl example. 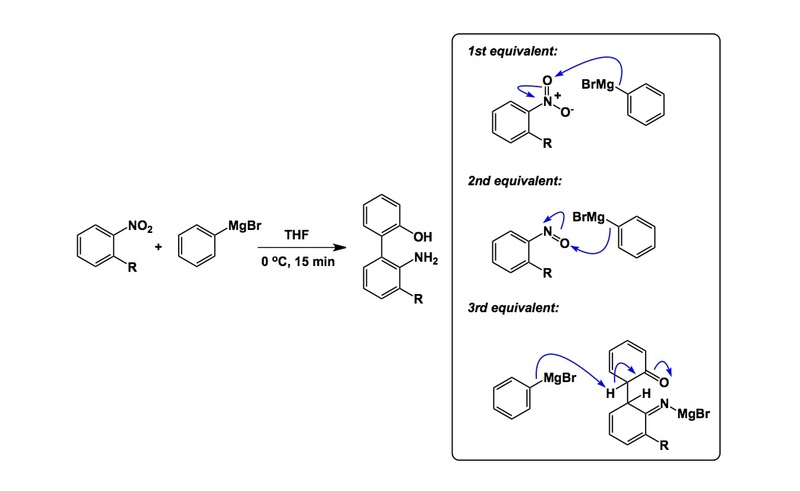 At least you have decarboxylation chemistry in your disposal and can “erase” one of the ester groups (if the rest of your molecule tolerates your conditions of choice, of course). At some point you feel dejected as no one asks questions along the lines of “Have you tried your reaction without the two methyl groups?” because everyone knows that you need the Thorpe-Ingold effect. They just give you a look that says “poor you”… It seems that gem-“anything” is bad news. But not necessarily. For a number of reasons, my lab has been looking at gem-dichloro aldehydes. Is this another one of those “gems”? I recalled to mind a great paper published by Tom Rovis and colleagues several years ago. In it, Tom showed a useful application for a molecule that contains a pair of “gem-offending” chlorines. In this case, what happens is a carbene-mediated transformation that leads to amide bond formation. Very cool stuff. Amino acid side chains participate in a number of reactions that result in peptide modification. Some of these reactions are of fundamental significance and play an important role in folding processes. Disulfide formation by oxidation of two proximal cysteine residues is one such case. Apart from its relevance in protein biochemistry, this reversible process also ensures structural integrity of fairly small cyclic peptide systems. Ziconotide is an example of a disulphide-rich analgesic agent derived from a conotoxin. There are also amino acid reactions one would want to avoid. Today I want to talk about threonine. I always viewed this amino acid with caution (and serine too). If you pay close attention, you will note that threonine looks like the product of an aldol reaction, in which the amide functionality acts as the enolate component, whereas acetaldehyde corresponds to the aldehyde partner. Whenever you see an adol process, you can be sure that its microscopic reverse is feasible. 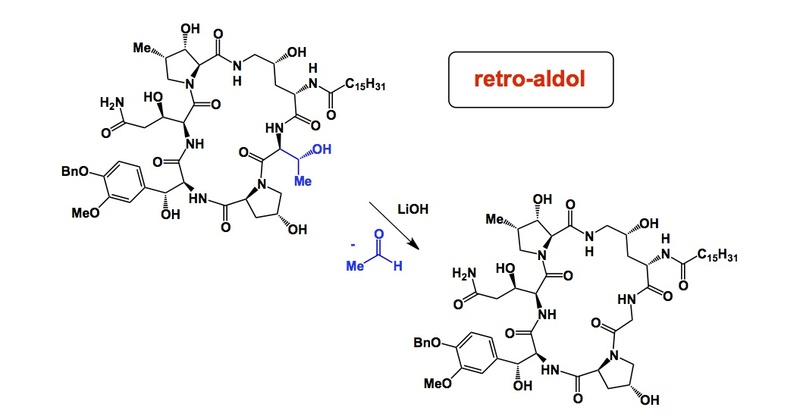 Writing in Organic Process Research and Development, a group from Astellas report a retro-aldol by-product in their synthesis of a cyclic peptide drug candidate. I think this is an important warning for those who work with serine and threonine containing peptides. Be careful with the base you use!